How big does the tent need to be? One of our customer service staff will be happy to assist you in planning out the proper tent size for your event. You can look at our Tent Size and Capacity Chart to get a basic idea of what you might need. We recommend booking as early as possible. Without a reservation, we cannot guarantee that the items you want will be in stock. Many people book several weeks or even months in advance. Call or email us for a quote. If you agree to the quote you receive, we will email or send you a contract for you to review. A signed contract and a 50% deposit is required to secure your reservation. The final payment is due when your rentals are delivered. You may also pay the remaining balance at anytime before your event. We accept cash or credit cards. When will my items be delivered and picked up? Delivery is usually scheduled 1 to 2 days before your event with pickup 1 to 2 days after. We will try to accommodate any special requests for delivery/pickup times. Same day delivery and drop off will usually require an additional charge. Who sets up and breaks down the equipment? 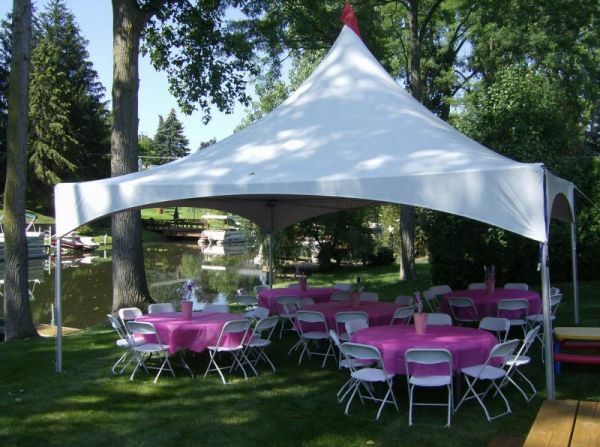 Our trained crew will set up all tents, side walls, flooring, and lighting. We will stack all tables and chairs neatly under the tent. When it comes time for pickup, all tables and chairs should be folded again under the tent. The area should be cleared so our crew may take down the tent and equipment without interference. Please do not try to take down the tent or remove the equipment yourself. What happens if items are damage or missing? The customer is responsible for all rentals from the time of delivery to pickup. If any items are damaged or go missing, the customer will be charged for the repair or replacement of the item. Do I need to get a permit? It is the responsibility of the client to check with your local Building Permit and Fire Departments several weeks prior to the installation date to confirm if any permits are required for your event. What about underground utilities or sprinkler systems? It is the responsibility of the client to advise us where the utilities lines are located. Call 811 at least a week before you allow anyone to stake a tent and get your underground utility lines marked for free. Your utility companies will then send a professional locator to your location to mark your lines within a few days. It is also the responsibility of the client to inform us of the location of any sprinkler systems. We will not be responsible for damage to any sprinkler systems that are not clearly located.